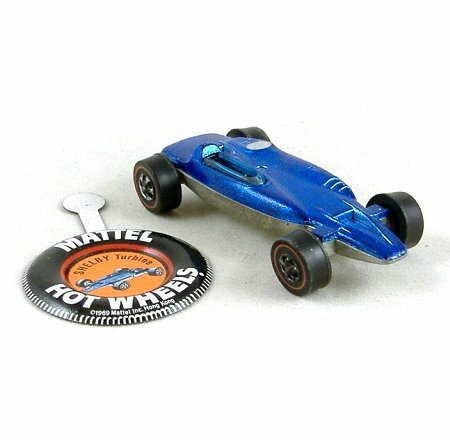 This early Hot Wheels model is based on a real turbine-powered racing car of which only two - or possibly three - were built. Finished in blue 'Spectraflame' paint with silver lower body and base. The driver's seat is black and the tiny windshield is blue tinted. Wheels are the famous 'Redline' type with low friction bearings. In excellent condition with one small paint chip on the rear and some loss of silver paint from the wheels. Complete with its original collector's button which is in mint condition.